Sarah originally got in touch with our team back in the summer of 2017 after a recommendation from the venue. After meeting Jack at the Donington Hall wedding open day, we were delighted when Sarah decided to go ahead and book with us. Although we have taken on the challenge of putting up fairy lighting and drapes in the past, this isn’t something that we had previous done at Donington Hall. Sarah was keen however for the bookcases in the library to be dressed and to add a little light and colour into the room. We decided that before we could commit ourselves to such a huge job we needed to have a test run on one of the 7 bookcases! After what seemed to take a life time we were finally happy! We tried a few different options, taking pictures of each stage to send to the bride to be! Afterwards we all agreed that the drapes and fairy lighting should go down to the floor, finishing with a bundle of fabric! 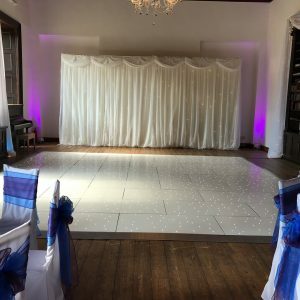 Along with our fairy lighting and drapes, Sarah also hired our wedding DJ, white LED dance floor, star-lit backdrop, magic mirror, uplighting, giant games and casino tables! It was great to see so many of our services come together to transform the space at Donington Hall. 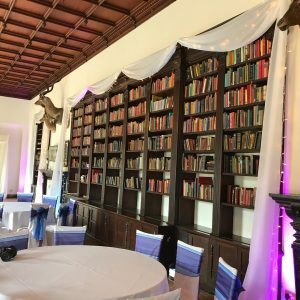 The uplighting was placed around the library, set to alternate blue and purple to tie in with the couples colour scheme. Also in the library with the bookcases all dressed we had our wedding DJ services, star-lit backdrop and 18ft square white LED dance floor. The library looked absolutely stunning. The final transformation blew us away, and it’s not often you say that about your own work! The giant games were set up outside on the patio and lawns for everyone to enjoy. These worked well with the outside space near the seating areas so that everyone was involved. In the red room is where the evening buffet took place, and later in the evening our Blackjack and Roulette tables. Before opening the casino ‘fun’ money was handed out to the guests and our Croupiers explained to those unsure how the casino was going to work. Once the casino opened it didn’t take long for them to be swamped with guests all ready to have a go and place their bets! The magic mirror was another great hit. 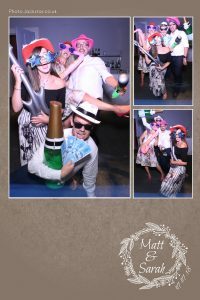 Positioned in the blue room (alongside the bar), guests enjoyed dressing up and striking a pose. On the night the magic mirror was printing two copies of each print. A copy for guests to take away and one for the guest book. On the night I looked after the magic mirror ensuring that the second copy of every print was stuck into the book and encouraging guests to leave a message. Shortly after Sarah and Matthew’s big day we sent the couple a digital copy of all the magic mirror photos. Now not only did they have their guest book to enjoy, but they can download and print extra copies if they wish. The online album is password protected which the couple can chose to share with their family and friends if they wish.